https://sep.yimg.com/ay/yhst-33477391359232/longhorn-cowfish-lactoria-cornuta-long-horn-cow-fish-9.jpgLonghorn Cowfish - Lactoria cornuta - Long Horn Cow Fish Expert Only!!! Not Cover Under Arrive GuaranteedPeaceful180 Gallon18.1 inchesYes, with CautionOmnivore, BrineIndo-PacificOstraciidaeSmall 1" - 2"
Longhorn Cowfish - Lactoria cornuta: The Cowfish is a desirable fish to hobbyists due to its comedic look, and its ability to adapt well to the aquarium environment. Juveniles of this species mainly occur in Brackish water, and then migrate to straight Saltwater upon maturing. The Longhorn Cowfish inhabit the reefs of the Indo-Pacific, usually in the less turbid waters. The body is yellow and covered with white dots, and is occasionally referred to as the Yellow Boxfish; however, the Longhorn is not to be confused with Ostracion cubicus, commonly called the Cube Boxfish, or Yellow or Polka Dot Boxfish. In the wild, it is not uncommon to see a 20" specimen, while in the aquarium the Longhorn Cowfish tends to be dramatically smaller - 16" or less. When possible, the Longhorn Cowfish should be the first fish introduced in the tank. It is intolerant of other Longhorns, so keep it in a large tank, with some live rock for algae scraping. Use caution if placing the Longhorn Cowfish in a reef tank as it may nibble on tubeworms. When housed correctly, the Longhorn Cowfish is long-lived. Similar to other boxfish, the Longhorn Cowfish's skin is poisonous, and when threatened, it will release a toxin lethal to other tank members, including other Longhorns. 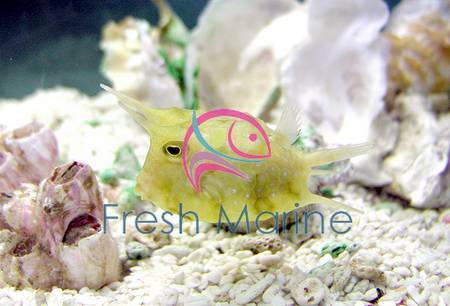 This peaceful boxfish has a lot of personality and needs to be kept in a peaceful community aquarium. The horns can be accidentally caught in ornaments in the aquarium so steps must be taken to ensure the safety for this particular animal. When shipped, there will be small pieces of Styrofoam or airline tubing on the horn tips. This is to ensure that the bag is not punctured or the horns damaged during shipping. You may remove them once the Longhorn Cowfish is acclimated. Sudden movement, sound or bright lights can easily stress the Longhorn Cowfish which can cause it to secrete a toxin that will likely wipe out your fish population. It is reported that this toxin does not affect invertebrates as easily. If you have a cowfish that is stressed or has died in your aquarium, it is recommended you do a series of substantial water changes and place a fresh bag of activated carbon somewhere in your filtration (usually near your return pump in your sump). Change carbon every 24 hours. Maximum Size: The Longhorn Cowfish grows up to 20 inches. Minimum Tank Size: The Longhorn Cowfish prefers a tank of at least 150 gallon gallons with plenty of places to hide & swim. Natural Environment: Longhorn Cowfish are found throughout the world, and are most commonly associated with coral reefs. They can also be found near rocky areas, sand flats or grass beds. Feeding and Diet: Feed a varied diet consisting of large chunks of meaty foods. These foods include krill, raw table shrimp, squid, clam and mussel. It is also a good idea to occasionally supplement with some type of herbivore diet containing marine algae. The Longhorn Cowfish will learn to swim near the surface and spit water as a form of begging at feeding time. This begging behavior, though cute, should be discouraged as it may swallow air and cause buoyancy problems.